Dr. York Tsuo is second from the right. The official event press release, Sec. McGinty Helps Break Ground on $100 Million Solar Manufacturing Project in Bucks County, is from the Pennsylvania Department of Environmental Protection (DEP). I do not see DEP Secretary Kathleen McGinty in either of the groundbreaking photographs. Perhaps she attended earlier, missed the ceremony, or was taking the photos? 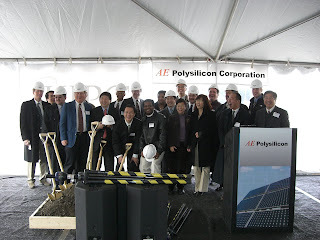 Global demand for clean energy and solar power in particular is booming; however, limited supplies of polysilicon have restrained the industry’s ability to mass produce affordable solar cells and modules. It is the company’s vision to advance the competitiveness of the solar energy industry by developing cost-effective technologies and creating strong relationships in the industry and local community. We are very excited to locate in Pennsylvania, with its strong commitment to developing a clean energy economy and its skilled workforce. 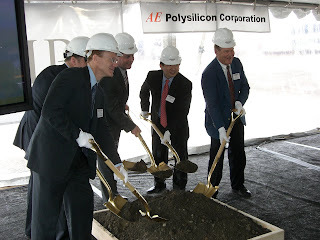 I believe Motech Industries, Inc. Chairman and President Dr. Simon Tsuo is at the far right. According to AE, major equipments have been ordered and installation had already begun for some equipments at a site near the facility. AE expects to enter into test production soon after the production facility has been completed. According to the construction plan, AE expects to commence test production in the fourth quarter of 2008.